Even if you’re not a massive hula hooper, chances are you’ve got an old hula hoop lying around. Often the cheap ones from a two dollar store degrade and aren’t great for spinning and doing tricks anymore. That’s cool! We’ve assembled 15 uses below as well as links to tutorials (you’re welcome). Your old hula hoop can be great again! Okay, this one is for those with backyard pools. Save on evaporation and heat up your pool with these homemade lily pad warmers! What a great idea to repurpose not just one old hula hoop, but a whoooole bunch. Be the ball! Or, you could be a giant jellyfish. Costumes are great way to incorporate found objects. I guess you’ll have to wait around until someone has a deep sea monsters party (I had one once, no lie). Or you could throw your own bash and be like a jelly. Old hula hoop to the rescue! Tutorials on how to make it here. One of my favourite uses for an old hula hoop is to cut it once, and use it in the garden as a cloche (“cloh-sh”) to protect veggies. Awesome as a project with kids or when you visit your mum’s backyard farm. Let’s get SHINY. Circles really can be repurposed in every way. Check out this funky DIY chandelier.. You could use an old hula hoop, or heck, even a new one, to create this beautiful light filled centrepiece in your home. You can create an entire art sculpture made entirely out of… a humble old hula hoop. It’s pretty mesmerising… If you’ve got 1-2000 hoops. See the insane shopping list here. Remember these crazy bags designed by Chanel? Soooo useful. Soooo handy. Learn how to make your very own overzised insane bag with an old hula hoop! Learn how to DIY here. This is quite possibly one of the best costume ideas I’ve ever seen. I kicked out something less interesting from the list in favour of sharing this shower costume with the world… featuring an old hula hoop. See a short tutorial here. Is it the season yet? Ahem, ahem! Get real DIY with this amazing christmas tree made out of hoops. You can decorate away so that old hula hoop gets covered and transformed into a beautiful butterfly! Weeeeee! Hot climate? Going travelling? Mosquito nets are super easy to make and in my opinion, one of the best utilities for an old hula hoop. Step one – work opened hula hoops into the ground. Step two – assemble your children and a soccer ball. Forts are becoming popular with adults again! Hooray! Okay, okay, and they’re great for kids. Assemble your very own nook by grabbing some sheeting or material, one old hula hoop, and draping fabric over it. Or see a more detailed tutorial here. This is just plain clever. 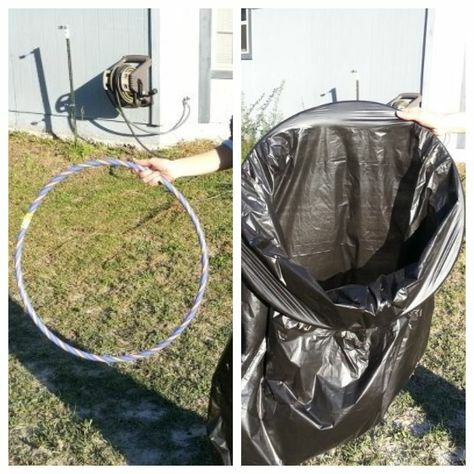 Best handy use of an old hula hoop goes to the Garbage Bag project. See how to make it on this site. Let’s get crafty! It doesn’t matter if your old hula hoop is mega ugly or covered in ripped old tape. Hide it by using it as the circular structure inside a rug project. Pretty gorgeous eh? Thank you internet! Never would I have thought to construct a bow and arrow from half an old hula hoop. Or two bows and arrows with one hula hoop. MATHS. It’s playtime. Wow this is so coooool. It’s like all my childhood dreams come true. You’re going to need a bubble mixture, a big vessel to hold the mixture in, and an old hula hoop. And some clothes that can get slimey. Learn how to make a giant bubble maker here! Our search turned up so many uses for an old hula hoop! Did we miss something on here? We’d love to hear from you below. Need a new hula hoop or a unique gift like a gift voucher for a hoop class or private lesson?